Northern Minnesota is a Hiker’s Heaven – pack your boots, sun block and camera and be assured the BeachFire Bar and Grille will have a cold beverage and a tasty meal ready for your return. Many of the hiking trails are also perfect for biking. Trapper’s Landing Lodge offers our guests complimentary Mountain Bikes for all sizes. Bikes are reserved on a first come, first served basis and can be rented for the day. Whether you’re looking to make tracks from Trapper’s Landing Lodge – or are willing to put a few miles on your vehicle to find that ultimate hiking/biking trail – the scenery, trails and experiences are as unique as a snowflake. Trek 12 miles of walking trails at the north end of Steamboat Bay on Leech Lake. Watch for everything from loons on the lake, to thirsty birds, deer and small mammals visiting the lake for a drink. The breeze off the lake will keep you cool and the waves lapping at the shore are sure to relax you – this is a peaceful trail to take any time of day. Just south of Walker is Minnesota’s oldest paved trail. Over the year’s this trail has felt millions of footsteps but the serene surrounding wilderness keeps all those human visitors a secret as it focuses you on the local wildlife, fragrant flowers and towering trees. When your kids return to school to write their “What I Did Last Summer” essays – let them include a cool story of how they walked around an entire lake. Lake Erin offers scenic views and peaceful wilderness and this easy 5-mile trail is perfect for the whole family. 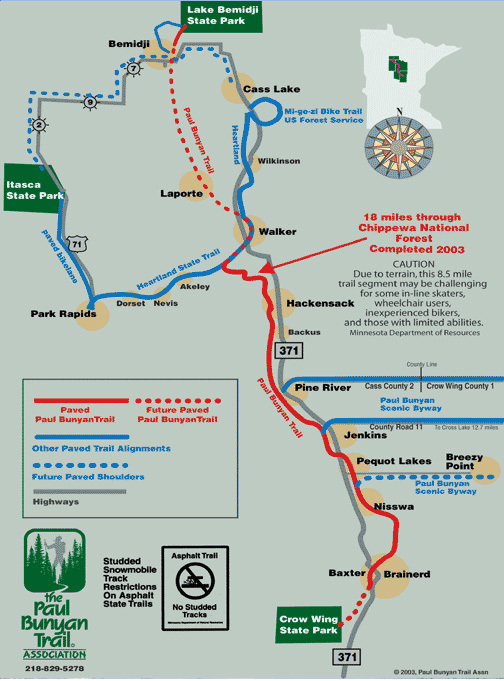 The Paul Bunyan State Recreational Trail wanders from Lake Bemidji State Park south through Walker to Crow Wing State Park. Portions of this trail, built along an abandoned rail corridor are hiker/biker friendly – however, some stretches have inclines that are a litte more challenging for explorers on wheels. This one-of-a-kind hike is a must for any adventurer and your only way to the trail is by boat! Set your sights on Star Island – the only island in the northern hemisphere to have it’s own lake. Once you arrive – trade the life jackets for hiking boots and take a hike around Star Island Lake. The lush Shingobee River Valley provides the perfect ambiance for a rejuvenating trek through the woods. The County Road 50 Trail is a great length at eight miles long. Looking for more than a walk in this area – You’ll enjoy year-round adventure in the 6 miles of the Shingobee Trail carved into the rolling hills of the River Valley. In the spring/summer/fall enjoy hiking, hunting, picnics and camping – Once the snow flies you’ll find cross-country skiing, sledding and even a warming chalet on weekends. Near the east edge of the Cass Lake and Pike Bay, this network of four paved trails are for man-power only. 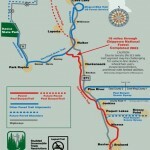 The construction of these trails makes for an easy trek, whether by foot or bike. If you’re out to see wildlife, this looping 9 mile trail through the Chippewa National Forest offers ample opportunity to see deer, raccoon, squirrels, eagles and a variety of other regional birds. Don’t forget to capture these critters on film! Walk across the headwaters of the Mississippi at Itasca State Park. Climb a retired fire tower and view the Northern Minnesota for as far as you can see. Tip-toe through a turn of last century grave yard and try to wrap your arms around the giant redwood trees. There’s so much to do and see in Itasca State Park, you’ll want to make a day of it. The Leech Lake is also home to six other state parks offering more adventure and excitement in the great outdoors.